It usually goes without saying that to be well, a patient must heal well. After treating maladies, hospitals nurture physical recovery. After diagnosing a problem, medical clinics service a physical need. After finding a cavity, a physical filling is applied. But what about the psychology of the patient? Both medical problems themselves and the process of seeking medical services induce anxiety. When designing Frankenbery Johnson Dental Clinic, Health Facilities Group operated on the belief that to heal well, a patient must also feel well. For a portion of the population, dentistry in particular provokes feelings of apprehension. To guarantee a calming healing environment for everyone, HFG’s design for Frankenbery Johnson created a serene oasis within the urban context of Wichita, KS. Situated next to a small lake, the clinic is separated from surrounding structures by the landscape and thick tree cover. A spacious lobby and gently curving corridors invite patients back towards exam rooms featuring full height windows overlooking the natural scenery. By appealing to the psychology of patients, Health Facilities Group worked to ease anxiety and encourage regular dental care amongst patients. Whether a dentistry clinic or an emergency room, the value of a fulfilled psychological need for comfort should not be ignored. After all, when patients feel mentally well, they are better prepared for the journey towards physical wellness. 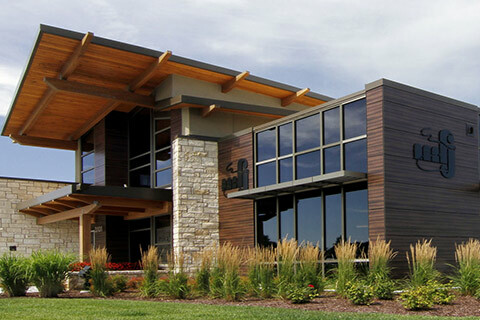 Health Facilities Group designed the Frankenbery Johnson Dental Clinic to be the largest dental clinic in Kansas. The 17,156 SF facility accommodates 5 dentists and has 30 operatory spaces. The structure utilizes quality interior finishes to accent its lakeside location, including full height windows. Key services provided by HFG include healthcare planning, space planning & programming, state-of-the-art medical design, economic analysis, and site planning.